There was a fire, a tornado, and the heating system went down in the ballot-tabulation room. There was fake news on social media and real news media in the room. Polls opened late and stayed open late. The state voter registration database went down. Tabulation machines failed to tabulate. There were concerned citizens and advocates demanding to know what was happening. And then there was Olga from Sputnik News who seemed overly curious about everything. Those were just some of the scenarios and situations faced by Colorado county elections officials and staff participating in the secretary of state’s EPIC table top exercise last week in Englewood. The day-long EPIC TTX was based on a similar tabletop training exercise conducted by the Belfer Center in March of this year with 38 state elections officials and was designed to help prepare county elections officials and their staff for any and every possibility. And based on reactions from county clerks in attendance, the effort of the secretary of state’s office was well worth it and many county clerks left Englewood vowing to put what they had learned into action immediately. The morning was divided into two sessions. In the first hour-long session, the groups drilled through problems and situations that could arise in the five months leading up to Election Day. During the second one-hour session it was Election Day. Moderators, which included elections officials from other states, national association staff and staff from the secretary of state’s office, helped move the sessions along. All participants were assigned a role for the day – some of those roles different from who they are in real life. Pulling off the EPIX TTX was a massive undertaking for the secretary of state’s office, but one that seems worth the effort. According to Judd Choate, director of elections, things went amazingly well. Choate wasn’t always so sure it was going to be the success that it was though. 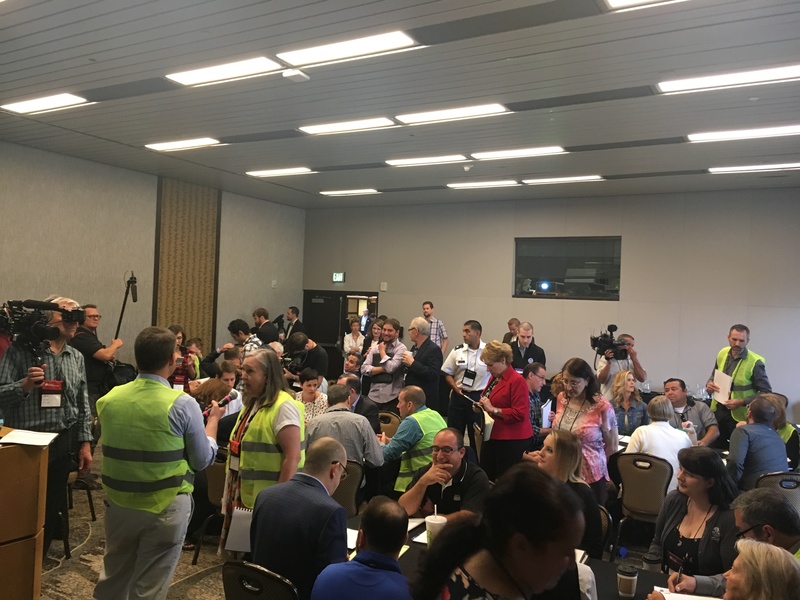 There were three informal teams for 1) scenario development, 2) logistics, and 3) counties, moderators, and observers (press too) coordination. “We will make several adjustments for future EPICs, but the basic format and scenarios worked very well,” Choate said. The tabletop exercise cost about $100,000 because the state paid for all county and moderator travel. Over 300 people attended, most of whom needed reimbursement (hotel, meals, mileage). The state will use the new HAVA funds to pay for the training. Following lunch, where Department of Homeland Security Secretary of State Kirstjen Nielsen addressed the gathering and called Colorado’s elections the most secure in the nation, the participants met based on their roles during the exercises to debrief and come up with five to six takeaways from their roles. The big takeaway from the day seemed to be communication. Either with the press, between the state and counties or between county clerks and their staff and the public, the importance of communication was brought up time and time again. Interestingly enough, Choate said that one issue the secretary’s office had in pulling off the TTX was with the media. Communication was also something that Lori Mitchell, Chaffee County clerk and recorder and current president of the Colorado County Clerks Association, said she could learn a thing or two about. Alton Dillard, the Denver Elections public information officer (PIO), said for him it was interesting to interact with elections officials from jurisdictions of different sizes and learn what their experiences working with the media have been like. In a reversal of roles, Dillard portrayed a reporter during the EPIC TTX so he got to ask questions of participants that were based on the ones he gets on daily basis. Several county officials were overheard mentioning that they wished they had brought their PIOs with them to the event. Dillard said the one thing he hopes the clerks take back to their PIOs is the importance of making sure that they are looped in early and often and keeping their communications plan updated. “Your communicator can’t be the last to know what may be going on in today’s environment,” Dillard said. In addition to communication, there were lots of important takeaways from the day, but for Wintz from Mineral County, she said it was hard to just pick one. In addition to luncheon remarks by the DHS secretary, there were more than 15 DHS officials at EPIC moderating, observing and participating the training. Choate said the secretary’s office they would like to do regional versions during one of their training cycles and do a full EPIC, with all counties represented on the odd years going forward. The clerks in attendance that we spoke to all highly recommended that those states that haven’t done tabletop exercises like this really should. Mitchell from Chaffee County said that in addition to states doing a similar tabletop exercise, counties too should consider putting on their own TTX. And Choate said the Colorado secretary of state’s office is ready to help! I can confirm first-hand that it was an amazing event; 180 days of chaos packed into two frenetic hours. The discussions during and after the exercise were incredibly valuable and I have little doubt that everyone in attendance learned a lot about what they need to be ready for – and respond to – whatever life throws their way on and before Election Day. Kudos to the Colorado SoS for hosting this event and thanks as always to Mindy for sharing the news. Stay tuned! 2 Comments on "electionlineWeekly on Colorado EPIC Cybersecurity Exercise"
I thought hope need to part of this! Congrats!